Religion Islam (Sunni, Shia and others), Christianity (Orthodoxy, Roman Catholicism), Judaism and other minor religions of the Middle East and the Balkans. The Ottoman Empire[dn 4] or Sublime Ottoman State (Ottoman Turkish: دَوْلَتِ عَلِيّهٔ عُثمَانِیّه Devlet-i ʿAliyye-yi ʿOsmâniyye, (also عثمانلى دولتى Osmanlı Devleti),[dn 5] Modern Turkish: Yüce Osmanlı Devleti or Osmanlı İmparatorluğu) which lasted from 27 July 1299 to 29 October 1923, is one of 16 Turkish empires established throughout history. With Constantinople (present-day Istanbul, Ottoman Turkish: استنبول, Istanbul and قسطنطينيه, Kostantiniyye) as its capital city, and vast control of lands around the eastern Mediterranean during the reign of Suleiman the Magnificent (ruled 1520 to 1566), the empire was at the center of interactions between the Eastern and Western worlds for six centuries. The Ottoman Empire came to an end, as a regime under a monarchy, on 1 November 1922. It formally ended, as a de jure state, on 24 July 1923, under the Treaty of Lausanne. The Republic of Turkey, which was officially proclaimed on 29 October 1923, became one of the successor states of the Ottoman Empire as part of the treaty. With the demise of the Seljuk Sultanate of Rum (c. 1300), Anatolia was divided into a patchwork of independent states, the so-called Ghazi emirates. By 1300, a weakened Byzantine Empire had lost most of its Anatolian provinces to ten Ghazi principalities. One of the Ghazi emirates was led by Osman I (from which the name Ottoman is derived), son of Ertuğrul, around Eskişehir in western Anatolia. In the foundation myth expressed in the medieval Turkish story known as "Osman's Dream", the young Osman was inspired to conquest by a prescient vision of empire (according to his dream, the empire is a big tree whose roots spread through three continents and whose branches cover the sky). According to his dream the tree, which was Osman's Empire, issued four rivers from its roots, the Tigris, the Euphrates, the Nile and the Danube. Additionally, the tree shaded four mountain ranges, the Caucasus, the Taurus, the Atlas and the Balkan ranges. During his reign as Sultan, Osman I, extended the frontiers of Ottoman settlement toward the edge of the Byzantine Empire. He also moved the Ottoman capital to Bursa, and shaped the early political development of the nation. In this period, a formal Ottoman government was created whose institutions would change drastically over the life of the empire. The government used the legal entity known as the millet, under which religious and ethnic minorities were allowed to manage their own affairs with substantial independence from central control. In the century after the death of Osman I, Ottoman rule began to extend over the Eastern Mediterranean and the Balkans. The important city of Thessaloniki was captured from the Venetians in 1387. The Ottoman victory at the Battle of Kosovo in 1389 effectively marked the end of Serbian power in the region, paving the way for Ottoman expansion into Europe. The Battle of Nicopolis in 1396, widely regarded as the last large-scale crusade of the Middle Ages, failed to stop the advance of the victorious Ottomans. With the extension of Ottoman dominion into the Balkans, the strategic conquest of Constantinople became a crucial objective. The Empire controlled nearly all former Byzantine lands surrounding the city, but the Byzantines were temporarily relieved when Timur invaded Anatolia in the Battle of Ankara in 1402. He took Sultan Bayezid I as a prisoner. Part of the Ottoman territories in the Balkans (such as Thessaloniki, Macedonia and Kosovo) were temporarily lost after 1402, but were later recovered by Murad II between the 1430s and 1450s. The capture of Bayezid I threw the Turks into disorder. The state fell into a civil war that lasted from 1402 to 1413, as Bayezid's sons fought over succession. It ended when Mehmed I emerged as the sultan and restored Ottoman power, bringing an end to the Interregnum. His grandson, Mehmed the Conqueror, reorganized the state and the military, and demonstrated his martial prowess by capturing Constantinople on 29 May 1453, at the age of 21. This period in Ottoman history can roughly be divided into two distinct eras: an era of territorial, economic, and cultural growth before 1566, followed by an era of relative military and political stagnation. Mehmed II enters Constantinople by Fausto Zonaro. Mehmed II made Constantinople (present-day Istanbul) the new capital of the Ottoman Empire, and he assumed the title of Kayser-i Rûm (Caesar Romanus = Roman Emperor). The Russian Tsars also claimed to be the successors to the eastern imperial title. To consolidate his claim, Mehmed II wanted to gain control over the Western capital, Rome, and Ottoman forces occupied parts of the Italian Peninsula. They started with the invasion of Otranto and Apulia on 28 July 1480. After Mehmed II's death on 3 May 1481 the campaign in Italy was cancelled and Ottoman forces retreated. During this period in the 15th and 16th centuries, the Ottoman Empire entered a long period of conquest and expansion, extending its borders deep into Europe and North Africa. Conquests on land were driven by the discipline and innovation of the Ottoman military; and on the sea, the Ottoman Navy aided this expansion significantly. The navy also contested and protected key seagoing trade routes, in competition with the Italian city states in the Black Sea, Aegean and Mediterranean seas and the Portuguese in the Red Sea and Indian Ocean. The state also flourished economically thanks to its control of the major overland trade routes between Europe and Asia. Battle of Mohács (1526) and the Ottoman conquest of Hungary. After his victory in the Battle of Mohács in 1526, he established Ottoman rule in the territory of present-day Hungary (except the western part) and other Central European territories, (See also: Ottoman–Hungarian Wars). He then laid siege to Vienna in 1529, but failed to take the city after the onset of winter forced his retreat. In 1532, he made another attack on Vienna, but was repulsed in the Siege of Güns, 97 kilometres (60 mi) south of the city at the fortress of Güns. In the other version of the story, the city's commander, Nikola Jurišić, was offered terms for a nominal surender. However, Suleiman withdrew at the arrival of the August rains and did not continue towards Vienna as previously planned, but turned homeward instead. After further advances by the Ottomans in 1543, the Habsburg ruler Ferdinand officially recognized Ottoman ascendancy in Hungary in 1547. During the reign of Suleiman, Transylvania, Wallachia and, intermittently, Moldavia, became tributary principalities of the Ottoman Empire. In the east, the Ottomans took Baghdad from the Persians in 1535, gaining control of Mesopotamia and naval access to the Persian Gulf. By the end of Suleiman's reign, the Empire's population totaled about 15,000,000 people. Suleiman's expansion into the Central Mediterranean was however halted in Malta in 1565. During a summer-long siege which was later to be known as the Siege of Malta, the Ottoman forces which numbered around 50,000 fought the Knights of St.John and the Maltese garrison which in total numbered around 6,000. Stubborn resistance by the Knights and the Maltese as well as infighting between the Turkish leaders led to the lifting of the Siege in September. The Ottomans' defeat in Malta in 1565 was the second and last one experienced by Suleiman the Magnificent, after the Ottoman defeat in Vienna in 1529. Under Selim and Suleiman, the Empire became a dominant naval force, controlling much of the Mediterranean Sea. The exploits of the Ottoman admiral Barbarossa Hayreddin Pasha, who commanded the Ottoman Navy during Suleiman's reign, led to a number of military victories over Christian navies. Among these were the conquest of Tunis and Algeria from Spain; and the capture of Nice from the Holy Roman Empire in 1543. This last conquest occurred on behalf of France as a joint venture between the forces of the French king Francis I and those of Barbarossa. France and the Ottoman Empire, united by mutual opposition to Habsburg rule in both Southern and Central Europe, became strong allies during this period. The alliance was economic and military, as the sultans granted France the right of trade within the Empire without levy of taxation. By this time, the Ottoman Empire was a significant and accepted part of the European political sphere. It made a military alliance with France, the Kingdom of England and the Dutch Republic against Habsburg Spain, Italy and Habsburg Austria. As the 16th century progressed, Ottoman naval superiority was challenged by the growing sea powers of western Europe, particularly Portugal, in the Persian Gulf, Indian Ocean and the Spice Islands. With the Ottomans blockading sea-lanes to the East and South, the European powers were driven to find another way to the ancient silk and spice routes, now under Ottoman control. On land, the Empire was preoccupied by military campaigns in Austria and Persia, two widely separated theatres of war. The strain of these conflicts on the Empire's resources, and the logistics of maintaining lines of supply and communication across such vast distances, ultimately rendered its sea efforts unsustainable and unsuccessful. The overriding military need for defence on the western and eastern frontiers of the Empire eventually made effective long-term engagement on a global scale impossible. European states initiated efforts at this time to curb Ottoman control of the traditional overland trade routes between East Asia and Western Europe, which started with the Silk Road. Western European states began to avoid the Ottoman trade monopoly by establishing their own maritime routes to Asia through new discoveries at sea. The Portuguese discovery of the Cape of Good Hope in 1488 initiated a series of Ottoman-Portuguese naval wars in the Indian Ocean throughout the 16th century. Economically, the huge influx of Spanish silver from the New World caused a sharp devaluation of the Ottoman currency and rampant inflation. This had serious negative consequences at all levels of Ottoman society. In southern Europe, a coalition of Catholic powers, led by Philip II of Spain, formed an alliance to challenge Ottoman naval strength in the Mediterranean Sea. Their victory over the Ottoman fleet at the Battle of Lepanto (1571) was a startling blow to the image of Ottoman invincibility. However, historians today stress the symbolic and not the strictly military significance of the battle, for within six months of the defeat a new Ottoman fleet of some 250 sail including eight modern galleasses had been built, with the harbours of Constantinople turning out a new ship every day at the height of the construction. In discussions with a Venetian minister, the Ottoman Grand Vizier commented: "In capturing Cyprus from you, we have cut off one of your arms; in defeating our fleet you have merely shaved off our beard". The Ottoman naval recovery persuaded Venice to sign a peace treaty in 1573, and the Ottomans were able to expand and consolidate their position in North Africa. However, what could not be replaced were the experienced naval officers and sailors. The Battle of Lepanto was far more damaging to the Ottoman navy in sapping experienced manpower than the loss of ships, which were rapidly replaced. By contrast, the Habsburg frontier had settled into a reasonably permanent border, marked only by relatively minor battles concentrating on the possession of individual fortresses. The stalemate was caused by a stiffening of the Habsburg defences and reflected simple geographical limits: in the pre-mechanized age, Vienna marked the furthest point that an Ottoman army could march from Constantinople during the early spring to late autumn campaigning season. It also reflected the difficulties imposed on the Empire by the need to support two separate fronts: one against the Austrians (see: Ottoman wars in Europe), and the other against a rival Islamic state, the Safavids of Persia (see: Ottoman wars in Near East). The Battle of Keresztes (1596) was part of the Long War (1593–1606) between the Ottoman and Habsburg empires, which ended with Ottoman victory, resulting in the Peace of Zsitvatorok in 1606. On the battlefield, the Ottomans gradually fell behind the Europeans in military technology as the innovation that fed the Empire's forceful expansion became stifled by growing religious and intellectual conservatism. Changes in European military tactics and weaponry in the military revolution caused the once-feared Sipahi cavalry to lose military relevance. The Long War against Habsburg Austria (1593–1606) created the need for greater numbers of infantry equipped with firearms. This resulted in a relaxation of recruitment policy and a significant growth in Janissary corps numbers. This contributed to problems of indiscipline, lack of effectiveness, and outright rebelliousness within the corps, which the government wrestled with but never fully solved during (and beyond) this whole period. The development of pike and shot and later linear tactics with increased use of firearms by Europeans proved deadly against the massed infantry in close formation used by the Ottomans. Irregular sharpshooters (Sekban) were also recruited for the same reasons and on demobilization turned to brigandage in the Jelali revolts (1595–1610), which engendered widespread anarchy in Anatolia in the late 16th and early 17th centuries. With the Empire's population reaching 30,000,000 people by 1600, shortage of land placed further pressure on the government. However, the 17th century was not simply an era of stagnation and decline, but also a key period in which the Ottoman state and its structures began to adapt to new pressures and new realities, internal and external. The Sultanate of women (1648–1656) was a period in which the political influence of the Imperial Harem was dominant, as the mothers of young sultans exercised power on behalf of their sons. This was not wholly unprecedented; Hürrem Sultan, who established herself in the early 1530s as the successor of Nurbanu, the first Valide Sultan, was described by the Venetian Baylo Andrea Giritti as "a woman of the utmost goodness, courage and wisdom" even though she "thwarted some while rewarding others". But the inadequacy of Ibrahim I (1640–1648) and the minority accession of Mehmed IV in 1646 created a significant crisis of rule, which the dominant women of the Imperial Harem filled. The most prominent women of this period were Kösem Sultan and her daughter-in-law Turhan Hatice, whose political rivalry culminated in Kösem's murder in 1651. This period gave way to the highly significant Köprülü Era (1656–1703), during which effective control of the Empire was exercised by a sequence of Grand Viziers from the Köprülü family. On September 15, 1656 the octogenarian Köprülü Mehmed Pasha accepted the seals of office having received guarantees from the Valide Turhan Hatice of unprecedented authority and freedom from interference. A fierce conservative disciplinarian, he successfully reasserted the central authority and the empire's military impetus. This continued under his son and successor Köprülü Fazıl Ahmed (Grand Vizier 1661–1676). The Köprülü Vizierate saw renewed military success with authority restored in Transylvania, the conquest of Crete completed in 1669 and expansion into Polish southern Ukraine, with the strongholds of Khotyn and Kamianets-Podilskyi and the territory of Podolia ceding to Ottoman control in 1676. This period of renewed assertiveness came to a calamitous end when Grand Vizier Kara Mustafa Pasha in May 1683 led a huge army to attempt a second Ottoman siege of Vienna in the Great Turkish War of 1683-1687. The final assault being fatally delayed, the Ottoman forces were swept away by allied Habsburg, German and Polish forces spearheaded by the Polish king Jan at the Battle of Vienna. The alliance of the Holy League pressed home the advantage of the defeat at Vienna and, thus, fifteen (15) years of see-sawing warfare, culminated in the epochal Treaty of Karlowitz (26 January 1699), which ended the Great Turkish War. For the first time, the Ottoman Empire surrender control of significant European territories (many permanently), including Ottoman Hungary. The Empire had reached the end of its ability to effectively conduct an assertive, expansionist policy against its European rivals and it was to be forced from this point to adopt an essentially defensive strategy within this theatre. Only two Sultans in this period personally exercised strong political and military control of the Empire: the vigorous Murad IV (1612–1640) recaptured Yerevan (1635) and Baghdad (1639) from the Safavids and reasserted central authority, albeit during a brief majority reign. Mustafa II (1695–1703) led the Ottoman counter attack of 1695–6 against the Habsburgs in Hungary, but was undone at the disastrous defeat at Zenta (September 11, 1697). During this period threats to the Ottoman Empire were presented by the traditional foe—the Austrian Empire—as well as by a new foe—the rising Russian Empire. The Ottomans ceded much territory in the Balkans to Austria. Certain areas of the Empire, such as Egypt and Algeria, became independent in all but name, and later came under the influence of Britain and France. Later, in the 18th century, centralized authority within the Ottoman Empire, gave way to varying degrees of provincial autonomy enjoyed by local governors and leaders. However, Russian expansion presented large and growing threat. Accordingly, King Charles XII of Sweden was welcomed as an ally in the Ottoman Empire following his defeat by the Russians at the Battle of Poltava in 1709 (part of the Great Northern War of 1700–1721.) Charles XII persuaded the Ottoman Sultan Ahmed III to declare war on Russia, which resulted in the Ottoman victory at the Pruth River Campaign of 1710–1711. The subsequent Treaty of Passarowitz signed on July 21, 1718, brought a period of peace between wars. However, the Treaty also revealed that the Ottoman Empire was on the defensive and unlikely to present any further aggression in Europe. Following the period of peace, which had lasted since 1739, Russia began to assert its expansionistic desires again in 1768. Under the pretext of pursuing fugitive Polish revolutionaries, Russian troops entered Balta an Ottoman-controlled city on the border of Bessarabia and massacred its citizens and burned the town to the ground. This action provoked the Ottoman Empire into the First Russo-Turkish War of 1768-1774. The Treaty of Kuchuk Kainraji of 1774 ended the First Russo-Turkish War and allowed that the Christian citizens of the Ottoman-controlled Rumanian provinces of Wallachia and Moldavia would be allowed freedom to worship. Russia was made the guarantor of their right to Christian worship. A series of wars were fought between the Russian and Ottoman empires from the 18th to the 19th century. By the late 18th century, a number of defeats in several wars with Russia led some people in the Ottoman Empire to conclude that the reforms of "Deli Petro" (Peter the Mad, as Peter the Great was known in Turkey) had given the Russians an edge, and the Ottomans would have to keep up with Western technology in order to avoid further defeats. The Serbian revolution (1804–1815) marked the beginning of an era of national awakening in the Balkans during the Eastern Question. Suzerainty of Serbia as a hereditary monarchy under its own dynasty was acknowledged de jure in 1830. In 1821, the Greeks declared war on the Sultan. A rebellion that originated in Moldavia as a diversion was followed by the main revolution in the Peloponnese, which, along with the northern part of the Gulf of Corinth, became the first parts of the Ottoman empire to achieve independence (in 1829). By the mid-19th century, the Ottoman Empire was called the "sick man" by Europeans. The suzerain states – the Principality of Serbia, Wallachia, Moldavia and Montenegro -- moved towards de jure independence during the 1860s and 1870s. During this period, the Empire faced challenges in defending itself against foreign invasion and occupation. The Empire ceased to enter conflicts on its own and began to forge alliances with European countries such as France, the Netherlands, Britain, and Russia. As an example, in the 1853 Crimean War, the Ottomans united with Britain, France, and the Kingdom of Sardinia against Russia. During the Tanzimat period (from Arabic تنظيم tanẓīm, meaning "organization") (1839–1876), the government's series of constitutional reforms led to a fairly modern conscripted army, banking system reforms, the decriminalisation of homosexuality, the replacement of religious law with secular law  and guilds with modern factories. In 1856, the Hatt-ı Hümayun promised equality for all Ottoman citizens regardless of their ethnicity and religious confession; which thus widened the scope of the 1839 Hatt-ı Şerif of Gülhane. Overall, the Tanzimat reforms had far-reaching effects. Those educated in the schools established during the Tanzimat period included Mustafa Kemal Atatürk and other progressive leaders and thinkers of the Republic of Turkey and of many other former Ottoman states in the Balkans, the Middle East and North Africa. These reforms included guarantees to ensure the Ottoman subjects perfect security for their lives, honour, and property; the introduction of the first Ottoman paper banknotes (1840) and opening of the first post offices (1840); the reorganization of the finance system according to the French model (1840); the reorganization of the Civil and Criminal Code according to the French model (1840); the establishment of the Meclis-i Maarif-i Umumiye (1841) which was the prototype of the First Ottoman Parliament (1876); the reorganization of the army and a regular method of recruiting, levying the army, and fixing the duration of military service (1843–44); the adoption of an Ottoman national anthem and Ottoman national flag (1844); the first nationwide Ottoman census in 1844 (only male citizens were counted); the first national identity cards (officially named the Mecidiye identity papers, or informally kafa kağıdı (head paper) documents, 1844); the institution of a Council of Public Instruction (1845) and the Ministry of Education (Mekatib-i Umumiye Nezareti, 1847, which later became the Maarif Nezareti, 1857); the abolition of slavery and slave trade (1847); the establishment of the first modern universities (darülfünun, 1848), academies (1848) and teacher schools (darülmuallimin, 1848); establishment of the Ministry of Healthcare (Tıbbiye Nezareti, 1850); the Commerce and Trade Code (1850); establishment of the Academy of Sciences (Encümen-i Daniş, 1851); establishment of the Şirket-i Hayriye which operated the first steam-powered commuter ferries (1851); the first European style courts (Meclis-i Ahkam-ı Adliye, 1853) and supreme judiciary council (Meclis-i Ali-yi Tanzimat, 1853); establishment of the modern Municipality of Istanbul (Şehremaneti, 1854) and the City Planning Council (İntizam-ı Şehir Komisyonu, 1855); the abolition of the capitation (Jizya) tax on non-Muslims, with a regular method of establishing and collecting taxes (1856); non-Muslims were allowed to become soldiers (1856); various provisions for the better administration of the public service and advancement of commerce; the establishment of the first telegraph networks (1847–1855) and railroads (1856); the replacement of guilds with factories; the establishment of the Ottoman Central Bank (originally established as the Bank-ı Osmanî in 1856, and later reorganized as the Bank-ı Osmanî-i Şahane in 1863) and the Ottoman Stock Exchange (Dersaadet Tahvilat Borsası, established in 1866); the Land Code (Arazi Kanunnamesi, 1857); permission for private sector publishers and printing firms with the Serbesti-i Kürşad Nizamnamesi (1857); establishment of the School of Economical and Political Sciences (Mekteb-i Mülkiye, 1859); the Press and Journalism Regulation Code (Matbuat Nizamnamesi, 1864); among others. Samuel Morse received his first ever patent for the telegraph in 1847, at the old Beylerbeyi Palace (the present Beylerbeyi Palace was built in 1861–1865 on the same location) in Constantinople, which was issued by Sultan Abdülmecid who personally tested the new invention. Following this successful test, installation works of the first telegraph line (Istanbul-Edirne-Şumnu) began on 9 August 1847. In 1855 the Ottoman telegraph network became operational and the Telegraph Administration was established. In 1871 the Ministry of Post and the Telegraph Administration were merged, becoming the Ministry of Post and Telegraph. In July 1881 the first telephone circuit in Istanbul was established between the Ministry of Post and Telegraph in the Soğukçeşme quarter and the Postahane-i Amire in the Yenicami quarter. On 23 May 1909, the first manual telephone exchange with a 50 line capacity entered service in the Büyük Postane (Grand Post Office) of Sirkeci. The first two railway lines in the Ottoman Empire entered service in 1856; these were the Cairo-Alexandria line (1856) and the İzmir-Aydın line (1856), the latter being operated by the Oriental Railway Company. They were followed by the Köstence-Boğazköy railway line (1860); the Smyrne Cassaba & Prolongements (1863) which operated between İzmir, Afyon and Bandırma; the Rusçuk–Varna railway line (1866); the Bükreş-Yergöğü railway line (1869); the Chemins de fer Orientaux (1869) which operated between Vienna, Banja Luka, Saraybosna, Niš, Sofia, Filibe, Edirne and Istanbul (starting from 1889 between Paris and Istanbul as the Orient Express); the Chemin de Fer Moudania Brousse (1871) which operated between Mudanya and Bursa; the Istanbul-Belovo railway line (1873); the Üsküp-Selânik railway line (1873); the Mersin-Tarsus-Adana Railway (1882); the Chemins de Fer Ottomans d'Anatolie (1888) which operated between Istanbul, Izmit, Adapazarı, Bilecik, Eskişehir, Ankara, Kütahya and Konya; the Jaffa–Jerusalem railway (1892); the Beirut-Damascus railway (1895); the Baghdad Railway (1904) which operated between Istanbul, Konya, Adana, Aleppo and Baghdad; the Jezreel Valley railway (1905) which operated between Acre, Haifa, Bosra, Hauran, Yagur, Daraa, Samakh, Beit She'an and Silat ad-Dhahr; the Hejaz Railway (1908) which operated between Istanbul, Konya, Adana, Aleppo, Damascus, Amman, Tabuk and Medina; the Eastern Railway (1915) which operated between Tulkarm and Lod; and the Beersheba Railway (1915) which connected Nahal Sorek with Beit Hanoun and Beersheba. The reformist period peaked with the Constitution, called the Kanûn-ı Esâsî (meaning "Basic Law" in Ottoman Turkish), written by members of the Young Ottomans, which was promulgated on November 23, 1876. It established the freedom of belief and equality of all citizens before the law. The Empire's First Constitutional era, was short-lived. But the idea of Ottomanism proved influential. A group of reformers known as the Young Ottomans, primarily educated in western universities, believed that a constitutional monarchy would give an answer to the Empire's growing social unrest. Through a military coup in 1876, they forced Sultan Abdülaziz (1861–1876) to abdicate in favour of Murad V. However, Murad V was mentally ill and was deposed within a few months. His heir-apparent, Abdülhamid II (1876–1909), was invited to assume power on the condition that he would declare a constitutional monarchy, which he did on November 23, 1876. The parliament survived for only two years before the sultan suspended it. When forced to reconvene it, he abolished the representative body instead. This ended the effectiveness of the Kanûn-ı Esâsî. The Christian millets gained privileges, such as in the Armenian National Constitution of 1863. This Divan-approved form of the Code of Regulations consisted of 150 articles drafted by the Armenian intelligentsia. Another institution was the newly formed Armenian National Assembly. The Christian population of the empire, owing to their higher educational levels, started to pull ahead of the Muslim majority, leading to much resentment on the part of the latter. In 1861, there were 571 primary and 94 secondary schools for Ottoman Christians with 140,000 students in total, a figure that vastly exceeded the number of Muslim children in school at the same time, who were further hindered by the amount of time spent learning Arabic and Islamic theology. In turn, the higher educational levels of the Christians allowed them to play a large role in the economy. In 1911, of the 654 wholesale companies in Constantinople, 528 were owned by ethnic Greeks. The Crimean War (1853–1856) was part of a long-running contest between the major European powers for influence over territories of the declining Ottoman Empire. Most of the conflict took place on the Crimean Peninsula, but there were smaller campaigns in western Anatolia, the Caucasus, the Baltic Sea, the Pacific Ocean and the White Sea. It is often considered to be one of the first "modern" wars, as it introduced technical changes which affected the future course of warfare, including the first tactical use of railways and the telegraph. It is also famous for the work of Florence Nightingale and Mary Seacole, who pioneered modern nursing practices while caring for wounded British soldiers. The Crimean War was one of the first wars to be documented extensively in written reports and photographs: notably by William Russell (for The Times newspaper) and Roger Fenton, respectively. News correspondence reaching Britain from the Crimea was the first time the public were kept informed of the day-to-day realities of war. The war caused an exodus of the Crimean Tatars. From the total Tatar population of 300,000 in the Tauride Province, about 200,000 Crimean Tatars moved to the Ottoman Empire in continuing waves of emigration. Toward the end of the Caucasian Wars, many Circassians fled their homelands in the Caucasus and settled in the Ottoman Empire. Since the 19th century, the exodus to present-day Turkey by the large portion of Muslim peoples from the Balkans, Caucasus, Crimea and Crete, had great influence in molding the country's fundamental features. These people were called Muhacir under a general definition. By the time the Ottoman Empire came to an end in 1922, half of the urban population of Turkey was descended from Muslim refugees from Russia. Crimean Tartar refugees in the late 19th century played an especially notable role in seeking to modernize Turkish education. The subsequent Treaty of Paris (1856) secured Ottoman control over the Balkan peninsula and the Black Sea basin until the Russo-Turkish War of 1877–1878. In 1804 the Serbian revolution against Ottoman rule erupted in the Balkans, running in parallel with the Napoleonic invasion. By 1817, when the revolution ended, Serbia was raised to the status of self-governing monarchy under nominal Ottoman suzerainty. In 1821 the First Hellenic Republic became the first Balkan country to achieve its independence from the Ottoman Empire. It was officially recognized by the Porte in 1829, after the end of the Greek War of Independence. The Congress of Berlin (13 June – 13 July 1878) was a meeting of the leading statesmen of Europe's Great Powers and the Ottoman Empire. In the wake of the Russo-Turkish War (1877–1878) that ended with a decisive victory for Russia and her Orthodox Christian allies (subjects of the Ottoman Empire before the war) in the Balkan peninsula, the urgent need was to stabilize and reorganize the Balkans, and set up new nations. German Chancellor Otto von Bismarck, who led the Congress, undertook to adjust boundaries to minimize the risks of major war, while recognizing the reduced power of the Ottomans, and balance the distinct interests of the great powers. In 1878, Austria-Hungary unilaterally occupied the Ottoman provinces of Bosnia-Herzegovina and Novi Pazar, but the Ottoman government contested this move and maintained its troops in both provinces. The stalemate lasted for 30 years (Austrian and Ottoman forces coexisted in Bosnia and Novi Pazar for three decades) until 1908, when the Austrians took advantage of the political turmoil in the Ottoman Empire that stemmed from the Young Turk Revolution and annexed Bosnia-Herzegovina, but pulled their troops out of Novi Pazar in order to reach a compromise and avoid a war with the Turks. The Ottoman Empire lost Novi Pazar with the First Balkan War in 1912. The results were first hailed as a great achievement in peacemaking and stabilization. However, most of the participants were not fully satisfied, and grievances regarding the results festered until they exploded in world war in 1914. Serbia, Bulgaria, and Greece made gains, but far less than they thought they deserved. The Ottoman Empire, called at the time the "sick man of Europe," was humiliated and significantly weakened, rendering it more liable to domestic unrest and more vulnerable to attack. Although Russia had been victorious in the war that occasioned the conference, it was humiliated at Berlin, and resented its treatment. Austria gained a great deal of territory, which angered the South Slavs, and led to decades of tensions in Bosnia and Herzogovina. Bismarck became the target of hatred of Russian nationalists and Pan-Slavists, and found that he had tied Germany too closely to Austria in the Balkans. In the long-run, tensions between Russia and Austria-Hungary intensified, as did the nationality question in the Balkans. The Congress succeeded in keeping Constantinople in Ottoman hands. It effectively disavowed Russia's victory. The Congress of Berlin returned to the Ottoman Empire territories that the previous treaty had given to the Principality of Bulgaria, most notably Macedonia, thus setting up a strong revanchist demand in Bulgaria that in 1912 led to the First Balkan War in which the Ottomans were defeated and lost nearly all of Europe. In 1882 British forces occupied Egypt on the pretext of bringing order. Egypt and Sudan remained as Ottoman provinces de jure until 1914, when the Ottoman Empire joined the Central Powers of World War I. Great Britain officially annexed these two provinces and Cyprus in response. Other Ottoman provinces in North Africa were lost between 1830 and 1912, starting with Algeria (occupied by France in 1830), Tunisia (occupied by France in 1881) and Libya (occupied by Italy in 1912). Although granted their own constitution and national assembly with the Tanzimat reforms, the Armenians attempted to demand implementation of Article 61 from the Ottoman government as agreed upon at the Congress of Berlin in 1878. Following pressure from the European powers and Armenians, Sultan Abdul Hamid II, in response, assigned the Hamidiye regiments to eastern Anatolia (Ottoman Armenia). These were formed mostly of irregular cavalry units of recruited Kurds. From 1894–96, between 100,000 to 300,000 Armenians living throughout the empire were killed in what became known as the Hamidian massacres. Armenian militants seized the Ottoman Bank headquarters in Constantinople in 1896 to bring European attention to the massacres, but they failed to gain any help. The Second Constitutional Era began after the Young Turk Revolution (3 July 1908) with the sultan's announcement of the restoration of the 1876 constitution and the reconvening of the Ottoman Parliament. It marks the dissolution of the Ottoman Empire. This era is dominated by the politics of the Committee of Union and Progress, and the movement that would become known as the Young Turks. Profiting from the civil strife, Austria-Hungary officially annexed Bosnia and Herzegovina in 1908, but pulled its troops out of the Sanjak of Novi Pazar, another contested region between the Austrians and Ottomans, to avoid a war. During the Italo-Turkish War (1911–12) in which the Ottoman Empire lost Libya, the Balkan League declared war against the Ottoman Empire, which lost its Balkan territories except East Thrace and the historic Ottoman capital city of Edirne (Adrianople) during the Balkan Wars (1912–13). Some 400,000 Muslims, out of fear for Greek, Serbian or Bulgarian atrocities, left with the retreating Ottoman army. The Baghdad Railway under German control became a source of international tension and played a role in the origins of World War I. In 1915, as the Russian Caucasus Army continued to advance in eastern Anatolia with the help of Armenian volunteer units from the Caucasus region of the Russian Empire, and aided by some Ottoman Armenians, the Ottoman government decided to issue the Tehcir Law, which started the deportation of the ethnic Armenians, particularly from the provinces close to the Ottoman-Russian front, resulting in what became known as the Armenian Genocide. Through forced marches and massacres, the Armenians living in eastern Anatolia were uprooted from their ancestral homelands and sent southwards to the Ottoman provinces in Syria and Mesopotamia. Estimates vary on how many Armenians perished during the Armenian Genocide but scholars give figures ranging from 300,000 (per the modern Turkish state), 600,000 (per early estimates by Western researchers) to up to 1.0 million to up to 1.5 million (per modern Western and Armenian scholars). The Arab Revolt which began in 1916 turned the tide against the Ottomans at the Middle Eastern front, where they initially seemed to have the upper hand during the first two years of the war. When the Armistice of Mudros was signed on October 30, 1918, the only parts of the Arabian peninsula that were still under Ottoman control were Yemen, Asir, the city of Medina, portions of northern Syria and portions of northern Iraq. These territories were handed over to the British forces on 23 January 1919. The Ottomans were also ordered to evacuate the parts of the former Russian Empire in the Caucasus (in present-day Georgia, Armenia and Azerbaijan), which they had gained towards the end of World War I, following Russia's retreat from the war with the Russian Revolution in 1917. The occupation of Constantinople along with the occupation of İzmir mobilized the establishment of the Turkish national movement, which won the Turkish War of Independence (1919–22) under the leadership of Mustafa Kemal Pasha. The Sultanate was abolished on 1 November 1922, and the last sultan, Mehmed VI Vahdettin (reigned 1918–22), left the country on 17 November 1922. The new independent Grand National Assembly of Turkey (GNA) was internationally recognized with the Treaty of Lausanne on 24 July 1923. The GNA officially declared the Republic of Turkey on 29 October 1923. The Caliphate was constitutionally abolished several months later, on 3 March 1924. The Sultan and his family were declared personae non gratae of Turkey and exiled. Bayezid Osman, the second son of Sultan Abdülmecid I's younger grandson, Ibrahim Tevfik, is now the current eldest surviving member of the former ruling dynasty. The Empire's communication technology was not sufficiently developed to reach all territories.In many ways, the circumstances surrounding the Ottoman Empire's fall closely paralleled those surrounding the decline of the Roman Empire, particularly in the ongoing tensions between the Empire's different ethnic groups, and the various governments' inability to deal with these tensions. In the case of the Ottomans, the introduction of increased cultural rights, civil liberties and a parliamentary system during the Tanzimat proved too late to reverse the nationalistic and secessionist trends that had already been set in motion since the early 19th century. Bankalar Caddesi (Banks Street) in Galata was the financial center of the Ottoman Empire. The Ottoman Central Bank is the first building at right. Ottoman government deliberately pursued a policy for the development of Bursa, Edirne (Adrianople) and Constantinople, successive Ottoman capitals, into major commercial and industrial centres, considering that merchants and artisans were indispensable in creating a new metropolis. To this end, Mehmed and his successor Bayezid, also encouraged and welcomed migration of the Jews from different parts of Europe, who were settled in Constantinople and other port cities like Salonica. In many places in Europe, Jews were suffering persecution at the hands of their Christian counterparts. The tolerance displayed by the Ottomans was welcomed by the immigrants. The Ottoman economic mind was closely related to the basic concepts of state and society in the Middle East in which the ultimate goal of a state was consolidation and extension of the ruler's power, and the way to reach it was to get rich resources of revenues by making the productive classes prosperous. The ultimate aim was to increase the state revenues without damaging the prosperity of subjects to prevent the emergence of social disorder and to keep the traditional organization of the society intact. The organization of the treasury and chancery were developed under the Ottoman Empire more than any other Islamic government and, until the 17th century, they were the leading organization among all their contemporaries. This organization developed a scribal bureaucracy (known as "men of the pen") as a distinct group, partly highly trained ulema, which developed into a professional body. The effectiveness of this professional financial body stands behind the success of many great Ottoman statesmen. The economic structure of the Empire was defined by its geopolitical structure. The Ottoman Empire stood between the West and the East, thus blocking the land route eastward and forcing Spanish and Portuguese navigators to set sail in search of a new route to the Orient. The Empire controlled the spice route that Marco Polo once used. When Vasco da Gama bypassed Ottoman controlled routes and established direct trade links with India in 1498, and Christopher Columbus first journeyed to the Bahamas in 1492, the Ottoman Empire was at its zenith, an economic power that extended over three continents. Modern Ottoman studies think that the change in relations between the Ottomans and central Europe was caused by the opening of the new sea routes. It is possible to see the decline in the significance of the land routes to the East as Western Europe opened the ocean routes that bypassed the Middle East and Mediterranean as parallel to the decline of the Ottoman Empire itself. The Anglo-Ottoman Treaty, also known as the Treaty of Balta Liman that opened the Ottoman markets directly to English and French competitors, would be seen as one of the staging posts along this development. The "Ottoman dynasty" or, as an institution, "House of Osman" was unprecedented and unequaled in the Islamic world for its size and duration. The Ottoman dynasty was ethnically Turkish in its origins, as were some of its supporters and subjects, however the dynasty immediately lost this "Turkic" identification through intermarriage with different ethnicities. On eleven occasions, the sultan was deposed because he was perceived by his enemies as a threat to the state. There were only two attempts in Ottoman history to unseat the ruling Osmanlı dynasty, both failures, which suggests a political system that for an extended period was able to manage its revolutions without unnecessary instability. The highest position in Islam, caliphate, was claimed by the sultan, which was established as Ottoman Caliphate. The Ottoman sultan, pâdişâh or "lord of kings", served as the Empire's sole regent and was considered to be the embodiment of its government, though he did not always exercise complete control. The Imperial Harem was one of the most important powers of the Ottoman court. It was ruled by the Valide Sultan. On occasion, the Valide Sultan would become involved in state politics. For a time, the women of the Harem effectively controlled the state in what was termed the "Sultanate of Women". New sultans were always chosen from the sons of the previous sultan. The strong educational system of the palace school was geared towards eliminating the unfit potential heirs, and establishing support among the ruling elite for a successor. The palace schools, which would also educate the future administrators of the state, were not a single track. First, the Madrasa (Ottoman Turkish: Medrese) was designated for the Muslims, and educated scholars and state officials according to Islamic tradition. The financial burden of the Medrese was supported by vakifs, allowing children of poor families to move to higher social levels and income. The second track was a free boarding school for the Christians, the Enderûn, which recruited 3,000 students annually from Christian boys between eight and twenty years old from one in forty families among the communities settled in Rumelia and/or the Balkans, a process known as Devshirme (Devşirme). The rapidly expanding empire used loyal, skilled subjects to manage the Empire, whether Albanians, Phanariot Greeks, Armenians, Serbs, Hungarians or others. The incorporation of Greeks (and other Christians), Muslims, and Jews revolutionized its administrative system. One of the successes of the social structure of the Ottoman Empire was the unity that it caused among its highly varied populations through an organization called millets. The millets were the major religious groups that were allowed to establish their own communities under Ottoman rule. The Millets were established by retaining their own religious laws, traditions, and language under the general protection of the sultan. Plurality was the key to the longevity of the Empire. As early as the reign of Mehmed II, extensive rights were granted to Phanariot Greeks, and Jews were invited to settle in Ottoman territory. Ultimately, the Ottoman Empire's relatively high degree of tolerance for ethnic differences were one of its greatest strengths in integrating the new regions but this non-assimilative policy became a weakness after the rise of nationalism. The dissolution of the Empire based on ethnic differentiation (balkanization) brought the end, which the failed Ottomanism among the citizens and participatory politics of the first or the constitutional Era had successfully addressed. The lifestyle of the Ottoman Empire was a mixture of western and eastern life. One unique characteristic of Ottoman life style was it was very fragmented. The millet concept generated this fragmentation and enabled many to coexist in a mosaic of cultures. The capital of the Ottoman Empire, Constantinople also had a unique culture, mainly because before Ottoman rule it had been the seat of both the Roman and Byzantine Empires. The lifestyle in the Ottoman court in many aspects assembled ancient traditions of the Persian Shahs, but had many Greek and European influences. The culture that evolved around the Ottoman court was known as the Ottoman Way, which was epitomized with the Topkapı Palace. There were also large metropolitan centers where the Ottoman influence expressed itself with a diversity similar to metropolises of today: Sarajevo, Skopje, Thessaloniki, Dimashq, Baghdad, Beirut, Jerusalem, Makkah and Algiers with their own small versions of Ottoman Provincial Administration replicating the culture of the Ottoman court locally. The seraglio, which were the non-imperial places, in the context of the Turkish fashion, became the subject of works of art, where non-imperial prince or referring to other grand houses built around courtyards. Slavery in the Ottoman Empire was a part of Ottoman society. As late as 1908 women slaves were still sold in the Empire. During the 19th century the Empire came under pressure from Western European countries to outlaw the practice. Policies developed by various Sultans throughout the 19th century attempted to curtail the slave trade but, since slavery did have centuries of religious backing and sanction, they could never directly abolish the institution outright—as had gradually happened in Western Europe and the Americas. Plague remained a major event in Ottoman society until the second quarter of the 19th century. Between 1701 and 1750, 37 larger and smaller plague epidemics were recorded in Constantinople, and 31 between 1751 and 1800. The Ottoman Empire had filled roughly the territories around the Mediterranean Sea and Black Sea while adopting the traditions, art and institutions of cultures in these regions and adding new dimensions to them. Many different cultures lived under the umbrella of the Ottoman Empire, and as a result, a specifically "Ottoman" culture can be difficult to define, except for those of the regional centers and capital. However, there was also a specific melding of cultures that can be said to have reached its highest levels among the Ottoman elite, who were composed of myriad ethnic and religious groups. This multicultural perspective of "millets" was reflected in the Ottoman State's multi-cultural and multi-religious policies. As the Ottomans moved further west, the Ottoman leaders absorbed some of the culture of the conquered regions. Intercultural marriages also played their part in creating the characteristic Ottoman elite culture. When compared to the Turkish folk culture, the influence of these new cultures in creating the culture of the Ottoman elite was clear. "Ottoman architecture" was influenced by Persian, Byzantine Greek and Islamic architectures. The Ottoman architecture are a continuation of the pre-Islamic Sassanid architecture. For instance, the dome covered square, which had been a dominant form in Sassanid became the nucleus of all Ottoman architecture. During the Rise period the early or first Ottoman architecture period, Ottoman art was in search of new ideas. The growth period of the Empire become the classical period of architecture, when Ottoman art was at its most confident. During the years of the Stagnation period, Ottoman architecture moved away from this style, however. During the Tulip Era, it was under the influence of the highly ornamented styles of Western Europe; Baroque, Rococo, Empire and other styles intermingled. Concepts of Ottoman architecture mainly circle the mosque. The mosque was integral to society, city planning and communal life. Besides the mosque, it is also possible to find good examples of Ottoman architecture in soup kitchens, theological schools, hospitals, Turkish baths and tombs. Examples of Ottoman architecture of the classical period, besides Istanbul and Edirne, can also be seen in Egypt, Eritrea, Tunisia, Algiers, the Balkans and Hungary, where mosques, bridges, fountains and schools were built. The art of Ottoman decoration developed with a multitude of influences due to the wide ethnic range of the Ottoman Empire. The greatest of the court artists enriched the Ottoman Empire with many pluralistic artistic influences: such as mixing traditional Byzantine art with elements of Chinese art. "Ottoman classical music" was an important part of the education of the Ottoman elite, a number of the Ottoman sultans were accomplished musicians and composers themselves, such as Selim III, whose compositions are often still performed today. Ottoman classical music arose largely from a confluence of Byzantine music, Arabic music, and Persian music. Compositionally, it is organised around rhythmic units called usul, which are somewhat similar to meter in Western music, and melodic units called makam, which bear some resemblance to Western musical modes. "Ottoman cuisine" refers to the cuisine of the capital—Constantinople, and the regional capital cities, where the melting pot of cultures created a common cuisine that all the populations enjoyed. This diverse cuisine was honed in the Imperial Palace's kitchens by chefs brought from certain parts of the Empire to create and experiment with different ingredients. The creations of the Ottoman Palace's kitchens filtered to the population, for instance through Ramadan events, and through the cooking at the Yalıs of the Pashas, and from there on spread to the rest of the population. Today, Ottoman cuisine lives in the Balkans, Anatolia and the Middle East, "common heirs to what was once the Ottoman life-style, and their cuisines offer treacherous circumstantial evidence of this fact". It is typical of any great cuisine in the world to be based on local varieties and on mutual exchange and enrichment among them, but at the same time to be homogenized and harmonized by a metropolitan tradition of refined taste. The exact population of the Ottoman Empire is a matter of much debate, due to the scantness and ambiguous nature of the primary sources. Figures from 1831 onwards are available as official census results, but the censuses did not cover the whole population. For example, the 1831 census only counted men and did not cover the whole empire. Ottoman Turkish was a Turkic language highly influenced by Persian and Arabic. The Ottomans had three influential languages: Turkish, spoken by the majority of the people in Anatolia and by the majority of Muslims of the Balkans except in Albania and Bosnia; Persian, only spoken by the educated; and Arabic, spoken mainly in Arabia, North Africa, Iraq, Kuwait and the Levant. Throughout the vast Ottoman bureaucracy Ottoman Turkish language was the official language, a version of Turkish, albeit with a vast mixture of both Arabic and Persian grammar and vocabulary. If the basic grammar was still largely Turkish, the inclusion of almost any word in Arabic or Persian in Ottoman made it a language that was essentially incomprehensible to any ethnic Turkish Ottoman subject who had not mastered Arabic, Persian or both. Because of a low literacy rate among the public (about 2–3% until the early 19th century and just about 15% at the end of 19th century), ordinary people had to hire special "request-writers" (arzuhâlcis) to be able to communicate with the government. The ethnic groups continued to speak within their families and neighborhoods (mahalles) with their own languages (e.g., Jews, Greeks, Armenians, etc.) In villages where two or more populations lived together, the inhabitants would often speak each other's language. In cosmopolitan cities, people often spoke their family languages, many non ethnic Turks spoke Turkish as a second language. Educated Ottoman Turks spoke Arabic and Persian. In the last two centuries, French and English emerged as popular languages, especially among the Christian Levantine communities. The elite learned French at school, and used European products as a fashion statement. The use of Turkish grew steadily under the Ottomans, but, since they were still interested in their two other official languages, they kept these in use as well. Usage of these became limited, though, and specific: Persian served mainly as a literary language for the educated, while Arabic was used for religious rites. Before adopting Islam—a process that was greatly facilitated by the Abbasid victory at the 751 Battle of Talas, which ensured Abbasid influence in Central Asia—the Turkic peoples practiced a variety of shamanism. After this battle, many of the various Turkic tribes—including the Oghuz Turks, who were the ancestors of both the Seljuks and the Ottomans—gradually converted to Islam, and brought the religion with them to Anatolia beginning in the 11th century. In the Ottoman Empire, in accordance with the Muslim dhimmi system, Christians were guaranteed limited freedoms (such as the right to worship), but were treated as second-class citizens. Christians and Jews were not considered equals to Muslims: testimony against Muslims by Christians and Jews was inadmissible in courts of law. They were forbidden to carry weapons or ride atop horses, their houses could not overlook those of Muslims, and their religious practices would have to defer to those of Muslims, in addition to various other legal limitations. The system commonly known as devşirme ("blood tax") was adopted: in this system children of the rural Christian populations of the Balkans were conscripted before adolescence and were brought up as Muslims. The Ottoman Empire was, in principle, tolerant towards Christians and Jews (the "Ahl Al-Kitab", or "People of the Book", according to the Qur'an) but not towards the polytheists, according to the Sharia law. Such tolerance was subject to a non-Muslim tax, the Jizya. The Ottoman Sultan Mehmed II allowed the local Christians to stay in Constantinople after conquering the city in 1453, and to retain their institutions such as the Greek Orthodox Patriarchate. In 1461 Sultan Mehmed II established the Armenian Patriarchate of Constantinople. Previously, the Byzantines considered the Armenian Church as heretical and thus did not allow them to build churches inside the walls of Constantinople. In 1492, when the Muslims and Sephardic Jews were expelled from Spain during the Spanish Inquisition, the Ottoman Sultan Bayezid II sent his fleet under Kemal Reis to save them and granted the refugees the right to settle in the Ottoman Empire. The state's relationship with the Greek Orthodox Church was largely peaceful, and recurrent oppressive measures taken against the Greek church were a deviation from generally established practice. The church's structure was kept intact and largely left alone but under close control and scrutiny until the Greek War of Independence of 1821–1829 and, later in the 19th century, the rise of the Ottoman constitutional monarchy, which was driven to some extent by nationalistic currents, tried to be balanced with Ottomanism. Other Orthodox churches, like the Bulgarian Orthodox Church, were dissolved and placed under the jurisdiction of the Greek Orthodox Patriarchate, until Sultan Abdülaziz established the Bulgarian Exarchate in 1870 and reinstated the autonomy of the Bulgarian Church. In 1514, Sultan Selim I, nicknamed “the Grim” because of his cruelty, ordered the massacre of 40,000 Anatolian Shi'ites, whom he considered heretics, reportedly proclaiming that "the killing of one Shiite had as much otherworldly reward as killing 70 Christians." In his recent PhD thesis  and in his recent book  the Israeli scholar Mordechai Zaken discussed the history of the Assyrian Christians of Turkey and Iraq (in the Kurdish vicinity) during the last 180 years, from 1843 onwards. In his studies Zaken outlines three major eruptions that took place between 1843 and 1933 during which the Assyrian Christians lost their land and hegemony in their habitat in the Hakkārī (or Julamerk) region in southeastern Turkey and became refugees in other lands, notably Iran and Iraq, and ultimately in exiled communities in European and western countries (the USA, Canada, Australia, New-Zealand, Sweden, France, to mention some of these countries). Mordechai Zaken wrote this important study from an analytical and comparative point of view, comparing the Assyrian Christians experience with the experience of the Kurdish Jews who had been dwelling in Kurdistan for two thousands years or so, but were forced to migrate the land to Israel in the early 1950s. The Jews of Kurdistan were forced to leave and migrate as a result of the Arab-Israeli war, as a result of the increasing hostility and acts of violence against Jews in Iraq and Kurdish towns and villages, and as a result of a new situation that had been built up during the 1940s in Iraq and Kurdistan in which the ability of Jews to live in relative comfort and relative tolerance (that was erupted from time to time prior to that period) with their Arab and Muslim neighbors, as they did for many years, practically came to an end. At the end, the Jews of Kurdistan had to leave their Kurdish habitat en masse and migrate into Israel. The Assyrian Christians on the other hand, came to similar conclusion but migrated in stages following each and every eruption of a political crisis with the regime in which boundaries they lived or following each conflict with their Muslim, Turkish, Arabs or Kurdish neighbors, or following the departure or expulsion of their patriarch Mar Shimon in 1933, first to Cyprus and then to the United States. Consequently, indeed there is still a small and fragile community of Assyrians in Iraq, however, millions of Assyrian Christians live today in exiled and prosperous communities in the west. The Ottoman legal system accepted the religious law over its subjects. The Ottoman Empire was always organized around a system of local jurisprudence. Legal administration in the Ottoman Empire was part of a larger scheme of balancing central and local authority. Ottoman power revolved crucially around the administration of the rights to land, which gave a space for the local authority develop the needs of the local millet. The jurisdictional complexity of the Ottoman Empire was aimed to permit the integration of culturally and religiously different groups. The Ottoman system had three court systems: one for Muslims, one for non-Muslims, involving appointed Jews and Christians ruling over their respective religious communities, and the "trade court". The entire system was regulated from above by means of the administrative Kanun, i.e. laws, a system based upon the Turkic Yasa and Töre, which were developed in the pre-Islamic era. The kanun law system, on the other hand, was the secular law of the sultan, and dealt with issues not clearly addressed by the sharia system. These court categories were not, however, wholly exclusive: for instance, the Islamic courts—which were the Empire's primary courts—could also be used to settle a trade conflict or disputes between litigants of differing religions, and Jews and Christians often went to them to obtain a more forceful ruling on an issue. The Ottoman state tended not to interfere with non-Muslim religious law systems, despite legally having a voice to do so through local governors. The Islamic Sharia law system had been developed from a combination of the Qur'an; the Hadīth, or words of the prophet Muhammad; ijmā', or consensus of the members of the Muslim community; qiyas, a system of analogical reasoning from earlier precedents; and local customs. Both systems were taught at the Empire's law schools, which were in Constantinople and Bursa. Tanzimat reforms drastically affected the law system. In 1877, the civil law (except family law) was codified in the Mecelle code. Later codifications covered commercial law, penal law and civil procedure. The first military unit of the Ottoman State was an army that was organized by Osman I from the tribesmen inhabiting western Anatolia in the late 13th century. The military system became an intricate organization with the advance of the Empire. The Ottoman military was a complex system of recruiting and fief-holding. The main corps of the Ottoman Army included Janissary, Sipahi, Akıncı and Mehterân. The Ottoman army was once among the most advanced fighting forces in the world, being one of the first to use muskets and cannons. The Ottomans began using falcons, which were short but wide cannons, during the Siege of Constantinople (1422). The Ottoman cavalry depended on high speed and mobility rather than heavy armour, using bows and short swords on fast Turkoman and Arabian horses (progenitors of the Thoroughbred racing horse), and often applied tactics similar to those of the Mongol Empire, such as pretending to retreat while surrounding the enemy forces inside a crescent-shaped formation and then making the real attack. The decline in the army's performance became clear from the mid-17th century and after the Great Turkish War. The 18th century saw some limited success against Venice, but in the north the European-style Russian armies forced the Ottomans to concede land. Ottoman pilots during the Balkan Wars of 1912–1913. The history of Ottoman military aviation dates back to 1909 between June 1909 and July 1911. The Ottoman Empire started preparing its first pilots and planes, and with the founding of the Aviation School (Tayyare Mektebi) in Yeşilköy on 3 July 1912, the Empire began to tutor its own flight officers. The founding of the Aviation School quickened advancement in the military aviation program, increased the number of enlisted persons within it, and gave the new pilots an active role in the Ottoman Army and Navy. In May 1913 the world's first specialized Reconnaissance Training Program was started by the Aviation School and the first separate reconnaissance division was established. In June 1914 a new military academy, the Naval Aviation School (Bahriye Tayyare Mektebi) was founded. With the outbreak of World War I, the modernization process stopped abruptly. The Ottoman aviation squadrons fought on many fronts during World War I, from Galicia in the west to the Caucasus in the east and Yemen in the south. ^ Article 18 of the Constitution of 1876 named the official language as Turkish, not Ottoman; Article 18: A prerequisite for Ottoman subject's employment in State service is that they know Turkish, which is the official language of the State. Tebâ'a-i Osmâniyenin hidemât-ı devlette istihdam olunmak için devletin lisân-ı resmîsi olan Türkçeyi bilmeleri şarttır, Geoffrey L. Lewis, The Turkish Language Reform: A Catastrophic Success, Oxford University Press, 1999, ISBN 9780198238560, p. 16. ^ In Republic of Ragusa which was under Ottoman protection. ^ The Treaty of Sèvres (10 August 1920) afforded a small existence to the Ottoman Empire. The Great National Assembly declared that the Ottoman sultanate abolished from 16 March 1920 (military occupation of Constantinople) on 1 November 1922. The official end of the Ottoman State was declared through the Treaty of Lausanne (24 July 1923). The "Ankara government", and not the Constantinople-based Ottoman government, was recognized by a major power as the sole representative of Turkey. The Ottoman government was practically headless after the sultan left the capital. The TBMM delared the successor state to be the modern-day "Republic of Turkey" (29 October 1923). ^ It was usually referred to as the "Ottoman Empire", the "Turkish Empire", the "Ottoman Caliphate" or more commonly "Turkey" by its contemporaries (since 1923, the name "Ottoman Empire" is preferred to avoid confusion with the Republic of Turkey, see Names of the Ottoman Empire). ^ Yücel Karadaş, Ziya Gökalp'te Şarkiyatçılık: Doğu'nun batıcı üretimi, Anahtar Kitaplar, 2008, p. 133. (Turkish), Osmanlı devrinde resmi dil olarak kullanılan Osmanlıca ile halk arasında konuşulan Türkçe, söz konusu dönemde kullanılan dillerdir. ^ "Ottoman banknote with Arabic script". http://www.twareekh.com/images/upload/aboutus/ottmani10liras1334F-.jpg. Retrieved 2010-08-26. ^ "A grammar of the Turkish language". Archive.org. http://www.archive.org/stream/grammarofturkish00davirich#page/xxvi/mode/2up. Retrieved 2011-11-06. ^ H. Feridun Demokan, Contemporary Turkey: Geography, History, Economy, Art, Tourism, Demokan, 1978, p. 4. ^ Necdet Evliyagil, Sami Güner, Basın-Yayın Genel Müdürlüğü, Ajans-Türk, Türkiye: Cumhuriyetin 50. Yıl Kitabı, Ajans-Türk Matbaacılık Sanayii, 1973. ^ "Religions - Islam: Ottoman Empire (1301-1922)". BBC. http://www.bbc.co.uk/religion/religions/islam/history/ottomanempire_1.shtml. Retrieved 2011-11-06. ^ "From the article on the Ottoman Empire in Oxford Islamic Studies Online". Oxfordislamicstudies.com. 2008-05-06. http://www.oxfordislamicstudies.com/article/opr/t125/e1801?_hi=41&_pos=3. Retrieved 2010-08-26. ^ The Sultanate was abolished on 1 November 1922. Mehmed VI, the last Ottoman Sultan, departed from Constantinople on 17 November 1922. ^ With the Treaty of Lausanne, signed on 24 July 1923, the new Turkish State – which was proclaimed a Republic later, on 29 October 1923 – headquartered in Ankara was internationally recognized as the successor to the Empire. ^ "Full text of the Treaty of Lausanne (1923)". Wwi.lib.byu.edu. http://wwi.lib.byu.edu/index.php/Treaty_of_Lausanne. Retrieved 26 August 2010. ^ Ahmad Razavi, Continental shelf delimination and related maritime issues in the Persian Gulf, Martinus Nijhoff Publishers, 1997, ISBN 9789041103338, p. 149. ^ Alan Rush, Al-Sabah: History & Genealogy of Kuwait's Ruling Family, 1752-1987, Ithaca Press, 1987, ISBN 9780863720819, p. 44. ^ Elie Kedourie, Nationalism in Asia and Africa, Routledge, 1974, ISBN 9780714630465, p. 49. ^ Michael Berenbaum, Abraham J. Peck, United States Holocaust Memorial Museum, The Holocaust and History: The Known, The Unknown, The Disputed, and The Reexamined, Indiana University Press, 1998, ISBN 9780253333742, p. 537. ^ Karpat, Kemal H. (1974). The Ottoman state and its place in world history. Leiden: Brill. p. 111. ISBN 90-04-03945-7. . A lock-hold on trade between western Europe and Asia is often cited as a primary motivation for Isabella I of Castile to fund Christopher Columbus's westward journey to find a sailing route to Asia and, more generally, for European seafaring nations to explore alternative trade routes (e.g. K. D. Madan, Life and travels of Vasco Da Gama (1998), 9; I. Stavans, Imagining Columbus: the literary voyage (2001), 5; W.B. Wheeler and S. Becker, Discovering the American Past. A Look at the Evidence: to 1877 (2006), 105). This traditional viewpoint has been attacked as unfounded in an influential article by A.H. Lybyer ("The Ottoman Turks and the Routes of Oriental Trade”, English Historical Review, 120 (1915), 577-588), who sees the rise of Ottoman power and the beginnings of Portuguese and Spanish explorations as unrelated events. His view has not been universally accepted (cf. K.M. Setton, The Papacy and the Levant (1204-1571), Vol. 2: The Fifteenth Century (Memoirs of the American Philosophical Society, Vol. 127) (1978), 335). ^ Savory, R. M. (1960). "The Principal Offices of the Ṣafawid State during the Reign of Ismā'īl I (907-30/1501-24)". Bulletin of the School of Oriental and African Studies, University of London 23 (1): 91–105. doi:10.1017/S0041977X00149006. JSTOR 609888. ^ Hess, Andrew C. (January 1973). "The Ottoman Conquest of Egypt (1517) and the Beginning of the Sixteenth-Century World War". International Journal of Middle East Studies 4 (1): 55–76. JSTOR 162225. ^ "Encyclopaedia Britannica". Britannica.com. http://www.britannica.com/EBchecked/topic/276730/Hungary/214181/History#ref=ref411152. Retrieved 2010-08-26. ^ "Encyclopaedia Britannica". http://cache-media.britannica.com/eb-media/47/20547-004-D655EA04.gif. Retrieved 2010-08-26. ^ Wheatcroft (2009), p. 59. ^ Itzkowitz, Norman. Ottoman Empire and Islamic Tradition, University of Chicago Press, ISBN 0-226-38806-9, pp. 64–65. ^ Itzkowitz, Norman. Ottoman Empire and Islamic Tradition, University of Chicago Press, ISBN 0-226-38806-9, p. 67. ^ Itzkowitz, Norman.Ottoman Empire and Islamic Tradition. University of Chicago Press, ISBN 0-226-38806-9, p.96. ^ Itzkowitz, Norman. Ottoman Empire and Islamic Tradition. University of Chicago Press, ISBN 0-226-38806-9, pp. 74–75. ^ Itzkowitz, Norman. Ottoman Empire and Islamic Tradition. University of Chicago Press, ISBN 0-226-38806-9, pp. 77–81. ^ Itzkowitz, Norman. Ottoman Empire and Islamic Tradition. University of Chicago Press, ISBN 0-226-38806-9, pp. 80–81. ^ Itzkowitz, Norman. Ottoman Empire and Islamic Tradition. University of Chicago Press, ISBN 0-226-38806-9, pp. 81–82. ^ Itzkowitz, Norman. Ottoman Empire and Islamic Tradition. University of Chicago Press, ISBN 0-226-38806-9, p. 84. ^ Itzkowitz, Norman. Ottoman Empire and Islamic Tradition. University of Chicago Press, ISBN 0-226-38806-9, p. 73. ^ Itzkowitz, Norman. Ottoman Empire and Islamic Tradition. University of Chicago Press, ISBN 0-226-38806-9, pp. 83–84. ^ The Cambridge History of Turkey: The later Ottoman Empire, 1603-1839, Ed. Suraiya Faroqhi, (Cambridge University Press, 2006), 443. ^ "History of the Istanbul Technical University". Itu.edu.tr. http://www.itu.edu.tr/en/?about/history. Retrieved 2011-11-06. ^ "Liberation, Independence and Union". Njegos.org. http://www.njegos.org/past/liunion.htm. Retrieved 2010-08-26. ^ Berend, Tibor Iván, History derailed: Central and Eastern Europe in the long nineteenth century, (University of California Press Ltd, 2003), 127. ^ "Ottoman Bank Museum: History of the Ottoman Bank". Obarsiv.com. http://www.obarsiv.com/ob-tarih.html. Retrieved 2011-11-06. ^ "Istanbul Stock Exchange: History of the Istanbul Stock Exchange". Imkb.gov.tr. http://www.imkb.gov.tr/genel/tarih.htm. Retrieved 2011-11-06. ^ a b "History of the Ottoman public debt". Gberis.e-monsite.com. http://gberis.e-monsite.com/categorie,osmanli-borclanma-tarihi-ottoman-debt-history,3219214.html. Retrieved 2011-11-06. ^ a b c "History of the Turkish Postal Service". Ptt.gov.tr. http://www.ptt.gov.tr/index.snet?wapp=histor_en&open=1. Retrieved 2011-11-06. ^ "Hijra and Forced Migration from Nineteenth-Century Russia to the Ottoman Empire"[dead link], by Bryan Glynn Williams, Cahiers du Monde russe, 41/1, 2000, pp. 79–108. ^ "Map of Europe and the Ottoman Empire in the year 1900". 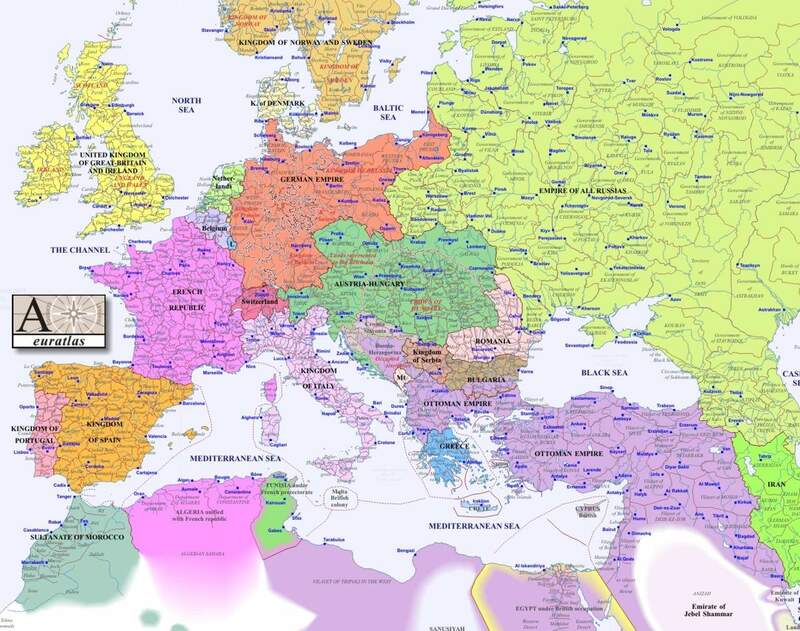 http://mapsof.net/uploads/static-maps/europe_map_1900.jpg. Retrieved 2011-11-06. ^ Hovannisian, Richard G.. "The Armenian Question in the Ottoman Empire, 1876–1914". The Armenian People from Ancient to Modern Times II: 218. ^ (PDF) Greek and Turkish refugees and deportees 1912–1924. NL: Universiteit Leiden. http://tulp.leidenuniv.nl/content_docs/wap/ejz18.pdf. ^ Encyclopædia Britannica. "Encyclopædia Britannica: Armenian massacres (Turkish-Armenian history)". Britannica.com. http://www.britannica.com/EBchecked/topic/35323/Armenian-massacres. Retrieved 2010-08-26. ^ Walker, Christopher J. "World War I and the Armenian Genocide". The Armenian People from Ancient to Modern Times II: 239–273. ^ Toynbee, Arnold J., The Treatment of Armenians in the Ottoman Empire 1915–16: Documents presented to Viscount Grey of Fallodon, Secretary of State for Foreign Affairs By Viscount Bryce. New York and London: G. P. Putnam's Sons, for His Majesty's Stationary Office, London, 1916, p. 650. ^ See Marashlian, Levon. Politics and Demography: Armenians, Turks, and Kurds in the Ottoman Empire. Cambridge, Mass. : Zoryan Institute, 1991. ^ Bilefsky, Dan. "Weary of Modern Fictions, Turks Glory in Splendor of Ottoman Past," New York Times. 5 December 2009. ^ "Political Obituaries: Ertugrul Osman". The Daily Telegraph. 2009-09-27. http://www.telegraph.co.uk/news/obituaries/politics-obituaries/6237121/Ertugrul-Osman.html. Retrieved 2009-10-26. ^ "'Last Ottoman' dies in Istanbul". BBC. 2009-09-24. http://news.bbc.co.uk/2/hi/europe/8273396.stm. Retrieved 2009-09-24. ^ Norman Itzkowitz, Ottoman Empire and Islamic Tradition p. 38. ^ "Enderun and Matraki". http://tamu.academia.edu/SencerCorlu/Papers/471488/The_Ottoman_Palace_School_Enderun_and_the_Man_with_Multiple_Talents_Matrakci_Nasuh. ^ "Supply of Slaves". Coursesa.matrix.msu.edu. http://coursesa.matrix.msu.edu/~fisher/hst373/readings/inalcik6.html. Retrieved 2010-08-26. ^ "Islam and slavery: Sexual slavery". Bbc.co.uk. http://www.bbc.co.uk/religion/religions/islam/history/slavery_7.shtml. Retrieved 2010-08-26. ^ Université de Strasbourg. Institut de turcologie, Université de Strasbourg. Institut d'études turques, Association pour le développement des études turques. (1998). Turcica. Éditions Klincksieck. p. 198. ^ "Eli Shah. The Ottoman Artistic Legacy". Mfa.gov.il. http://www.mfa.gov.il/MFA/MFAArchive/1990_1999/1999/2/The%20Ottoman%20Artistic%20Legacy. Retrieved 2010-08-26. ^ Kemal H. Karpat (2002). Studies on Ottoman social and political history: selected articles and essays. Brill. p. 266. ISBN 9004121013. http://books.google.com/?id=082osLxyBDgC&pg=PA266&dq=arzuhalci#v=onepage&q=arzuhalci&f=false. ^ "Tile – Victoria & Albert Museum – Search the Collections". Collections.vam.ac.uk. 2009-08-25. http://collections.vam.ac.uk/item/O106609/tile/. Retrieved 2010-08-26. ^ Shaw and Shaw. History of the Ottoman Empire, pp. 112–129. ^ Jalāl Āl Aḥmad, Plagued by the West (Gharbzadegi), translated by Paul Sprachman. Delmor, NY: Center for Iranian Studies, Columbia University, 1982. ^ Mordechai Zaken,"Tribal chieftains and their Jewish Subjects: A comparative Study in Survival: PhD Thesis, The Hebrew University of Jerusalem, 2004. ^ Mordechai Zaken,"Jewish Subjects and their tribal chieftains in Kurdistan: A Study in Survival", Brill: Leiden and Boston, 2007. ^ "Story of Turkish Aviation in 'Turkey in the First World War' website". Turkeyswar.com. http://www.turkeyswar.com/aviation/aviation.htm. Retrieved 2011-11-06. ^ Hv. K. K. Mebs. ""Founding" in Turkish Air Force official website". Hvkk.tsk.tr. http://www.hvkk.tsk.tr/EN/IcerikDetay.aspx?ID=19. Retrieved 2011-11-06. Stone, Norman "Turkey in the Russian Mirror" pages 86–100 from Russia War, Peace and Diplomacy edited by Mark & Ljubica Erickson, Weidenfeld & Nicolson: London, 2004 ISBN 0297849131. Gürkan, Emrah Safa: Christian Allies of the Ottoman Empire, European History Online, Mainz: Institute of European History, 2011, retrieved: November 2, 2011.